Is this it? Are we done? Have we finally caught up with all the reveals from a weekend filled with game announcements? 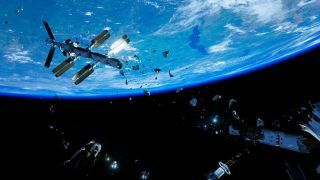 Is Adr1ft's isolated fragility symbolic of the inevitable ennui that follows days scouring for digital information while hooked to an angry, throbbing internet? Probably not, no; it's about space. As you can tell from the trailer, Adr1ft (Adroneft?) is the story of an astronaut in what could be, in scientific terms, described as a sticky situation. "Floating silently amongst the wreckage of a destroyed space station with no memory and a severely damaged EVA suit, the only survivor struggles to determine the cause of the catastrophic event that took the lives of everyone on board. The player fights to stay alive by exploring the wreckage for precious resources, and overcomes the challenges of an unforgiving environment to repair the damaged emergency escape vehicle and safely return home." Also on that page is the term "first-person experience," or "FPX," which, now I've seen it in use, makes me want to burn down the entire world with matches. Nevertheless, the game itself looks great—intriguing and undoubtedly beautiful. It's coming out on PC next Summer, and will offer Oculus Rift support too.